The former ITG product continues its new existence under the Leaf banner as 2017-18 Leaf Stickwork Hockey. 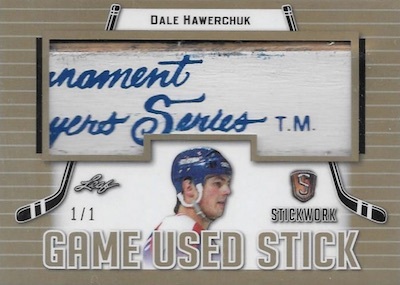 Again heavily focused on hockey stick relics, each box includes four hits per box. Although the 2017 edition was branded as an In The Game (ITG) release, the format and general look remain the same. Production is limited to 150 cases (1,500 boxes). The majority of the hit cards in 2017-18 Leaf Stickwork Hockey are, naturally, stick relics, including single-player and multi-player options. Single-player relics include jumbo Game-Used Stick and Game-Used Goalie Stick. 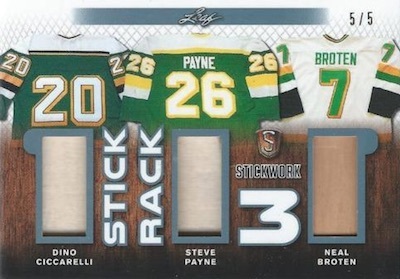 Obviously, Nameplates displays the actual stick nameplate on the one-of-one card. New for '17-18, Super Blade features an oversized stick blade piece, while Sticks & Stones celebrates some of the best-known fighters on the ice with four relics per card. Many of the 2017-18 Leaf Stickwork Hockey relic sets highlight multiple players, as well. Tape to Tape works with the tape taken from game-used sticks for various duos. The eight-player Tape 8 takes that up a notch with an octo-relic card. Stick Rack 3 and Stick Rack Four both honor retired legends with game-used stick memorabilia. There are also new choices, such as the six-player Titan of Timber. 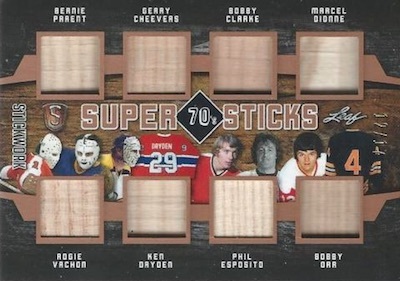 Each with eight relics, the decade-specific Super Sticks line covers the '50s, '60s, '70s, '80s, and '90s, while Team Twigs is based around players from the same franchise. Catering to the autograph hounds, the 2017-18 Leaf Stickwork Hockey checklist boasts a few signed relics. The new Signature Sticks insert is issued in single and dual form. 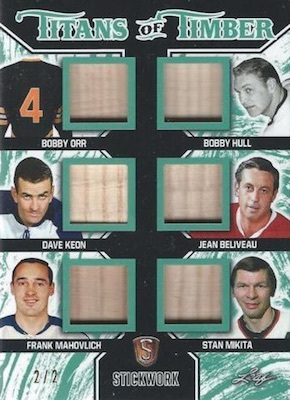 Somewhat like a cut signature, Lumbergraphs cards feature a cut autograph taken directly from a hockey stick. Buy 2017-18 Leaf Stickwork Hockey cards on eBay. PARALLEL CARDS: Silver #/9 or less, Platinum #/5 or less, Red #/3, Emerald #/2, Gold 1/1, Plates 1/1. PARALLEL CARDS: Silver #/7 or #/6, Platinum #/5 or #/4, Red #/3, Emerald #/2, Gold 1/1, Plates 1/1. 30 cards. Serial numbered 1/1. PARALLEL CARDS: Silver #/7 or less, Platinum #/5 or #/4, Red #/3, Emerald #/2, Gold 1/1. PARALLEL CARDS: Silver #/7 or #/5, Platinum #/5 or #/4, Red #/3, Emerald #/2, Gold 1/1. 53 cards. Serial numbered 1/1. PARALLEL CARDS: Silver #/7 or #/6, Platinum #/5 or #/4, Red #/3, Emerald #/2, Gold 1/1. 18 cards. Serial numbered #/17. PARALLEL CARDS: Silver #/7, Platinum #/5, Red #/3, Emerald #/2, Gold 1/1. 9 cards. Serial numbered #/19. PARALLEL CARDS: Silver #/9, Platinum #/5, Red #/3, Emerald #/2, Gold 1/1. 14 cards. Serial numbered #/4. PARALLEL CARDS: Red #/3, Emerald #/2, Gold 1/1. 11 cards. Serial numbered #/17. 5 cards. Serial numbered #/12. 14 cards. Serial numbered #/8. PARALLEL CARDS: Silver #/6, Platinum #/4, Red #/3, Emerald #/2, Gold 1/1. 7 cards. Serial numbered #/17. View the 2017-18 Leaf Stickwork Hockey checklist spreadsheet. Very Excited for the release of Stickworks !! !